Not even dinner time and I am gazing at a full (and brightly coloured) grid. The numpties realized at once, as we laboured through that preamble, that highlighters were needed and we were going to have to keep a very careful check on the different types of game that Zag was playing with us. Ironically, this meant (seen in retrospect) that the numerical numpty was doing the solving and the ‘verbal’ numpty was keeping tabs on how many letters had appeared in each category (extra letter in the wordplay/ misprint in the definition/ normal with intial letters to be recorded/ extra letter in the defintion/ incorrect letter provided by the wordplay). SAVANT and UNIX (‘Getting it by five, worker possibly is accomplished’ and ‘Before nine, unit lacks information technology that allows computers to operate’) were solved while I was finding highlighters and a pencil. Looking back, I have to surmise that those were just two clues that Zag couldn’t fit into his system, so they had to be clued normally with no gimmick. He didn’t give us much Listener setter alcoholly tippliness either – perhaps still recovering from last weekend’s Listener dinner – but his clues were very transparent and generous. In just over an hour, we had a complete grid (almost) with all of those two-letter clues more or less sussed out. ‘The writer’s [I’M] not any [NO] hate [UG] thanks [TA] to [AT] Sun’s representative’ [RA]. Since writing this blog I have been asked by a couple of people what the point of that separate clue was, since it only confirms what was already in the grid for most solvers. I am no expert but can explain that they fulfil the requirement for setters with regard to unchecked lights. 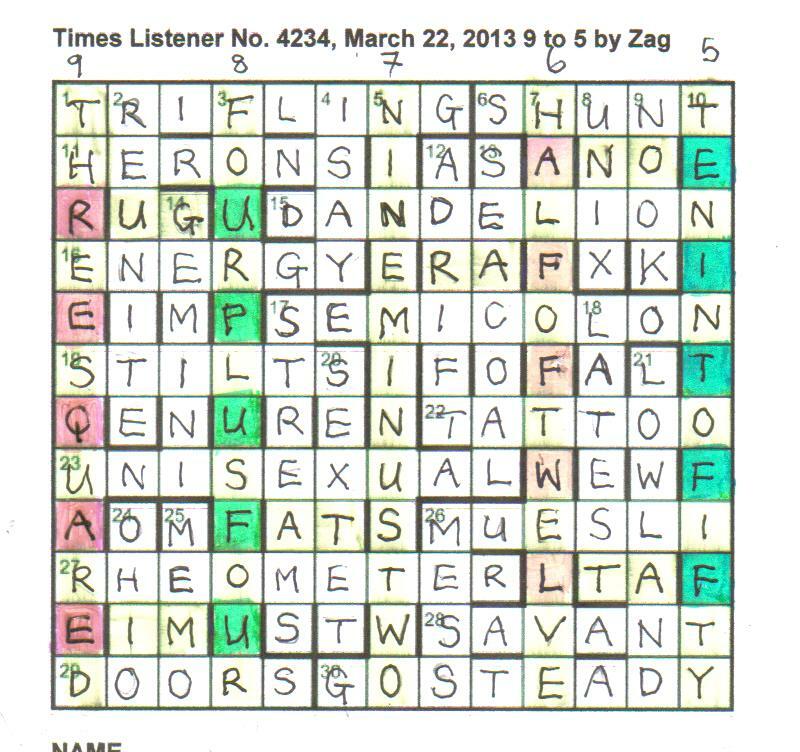 If you look at OHIO and MEMO, for example, a setter is not allowed more than one ‘unch’ in a word that is five, four or three letters long, so Zag has had to give a clue for the two-letter bits that appeared because of his grid construction. ‘Almost’ complete, I said. Naturally it was a small word that was left. We had ?HIO for 24d and the clue ‘How gratifying to entertain one, one of status!’ As usual, in retrospect, the answer is obvious but we had to double-check all our missing and extra letters and sort out a couple of problems before we were able to convince ourselves that it was the U of statUs that was a misprint in the definition, giving us one of statEs – OHIO. Totally satisfying, very rewarding and just my kind of Listener. Thank you Zag! This entry was posted on 12 April 2013 at 4:10 pm	and is filed under Solving Blogs. Tagged: 9 to 5 by Zag. You can follow any responses to this entry through the RSS 2.0 feed. You can leave a response, or trackback from your own site.